Wiseman, D Poulton-le-Fylde Once Upon a Time. D.Wiseman. 1979. Poulton-le-Fylde has a long history. It is recorded in Domesday, together with over sixty other small communities in Amounderness, a sparsely populated coastal area of north-west Lancashire. From its earliest days Poulton has served as a market town, supplying goods and services needed by the outlying farms and communities. The ancient parish church dedicated to St Chad stands at the head of the Market Place. While retaining its medieval street layout, planning decisions made over recent years have changed Poulton from the small rural market town of the early twentieth century to the community of today and inevitably some of the town’s historical legacy has been lost. 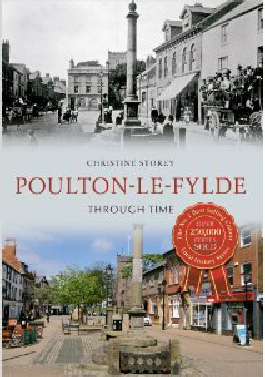 This book records some of poulton’s past and compares it with the present scene, a reminder of what has gone and maybe a surprise to more recent residents. The book begins with the earliest recorded human activity in the area and subsequently follows the life of local people throughout the centuries. 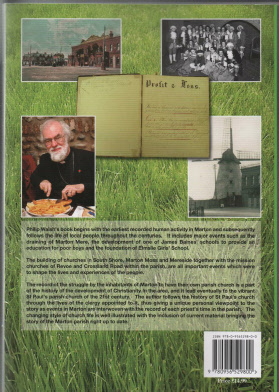 It includes major events such as the draining of Marton Mere, the development of one of James Baines’ three schools, set up in Marton, Thornton and Hardhorn to provide an education for poor boys, the foundation of Elmslie School and the arrival of Holy Trinity and St Nicholas’ churches, among others, within the parish, together with many other important events which were to shape the lives and experiences of the people. The record of the struggle by the inhabitants of Marton to have their own parish church is a part of the history of the development of Christianity in the area, and it lead eventually to the vibrant St Paul’s parish church of the 21st century. 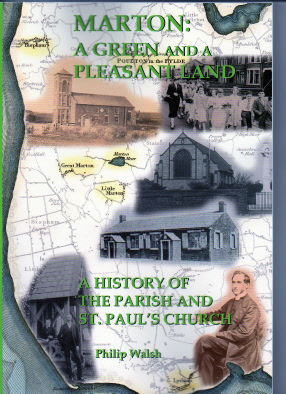 The author follows the history of St Paul’s church through the lives of the clergy appointed to it, thus giving a unique personal viewpoint to the story as events in Marton are interwoven with the record of each priest’s time in the parish. The changing style of church life is well illustrated with the inclusion of current material bringing the story of St Paul’s parish right up to date. But apart from this wide ranging and detailed history, through his diligent and far reaching research, the author has succeeded in bringing to light some important new evidence, such as re-identification of the well known image of James Baines, tithemap evidence for the site of an early church and the earliest use of Marton’s schoolroom as a place of worship. The inclusion of sources and references is a major and very welcome feature of the book, making it an important addition to the record of the development of both Marton and the wider area. It is a valuable source of information for both the interested general reader and the local historian and a welcome addition to the collection of material available on the local area. 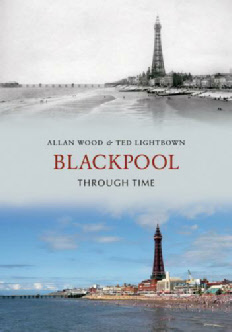 Blackpool Through Time is a unique insight into the illustrious history of this part of the country. Reproduced in full colour, this is an exciting examination of Blackpool, the famous streets and the famous faces, and what they meant to the people of this seaside resort throughout the 19th and into the 20th Century. Looking beyond the exquisite exterior of these well-kept photos, readers can see the historical context in which they are set and through the author's factual captions for every picture, and carefully-selected choice of images, the reader can achieve a reliable view of this town’s history. Readers are invited to follow a timeline of events and watch the changing face of this lively town, as the authors guide us through the streets of Blackpool. There is something for everyone here, whether they have lived in the area all their lives, or whether they are just visiting this resort for the first time. Blackpool Through Time also shows how photography has continually evolved to keep up with an ever-changing society.